Although I've always been a fan of coffee, it was only late last year that I got a first taste of Bo's Coffee. Having only experienced lounging at their SM Mall of Asia branch, I didn't have an idea if this cozy chain of coffee shop is an international franchise. At the back of my mind, I think it is. After an afternoon lounging session at the sleek and comfy Bo's Coffee in SM North Annex, I found out that this personal venture of Mr. Steve D. Benitez is actually homegrown. 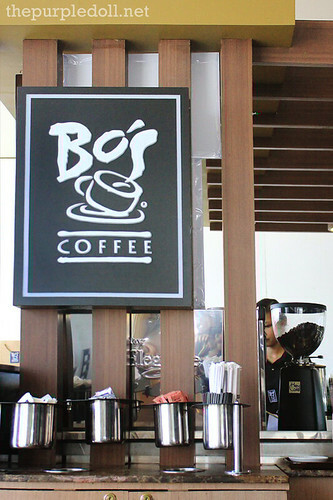 In June 28, 1996, Bo's Coffee first opened its doors at Ayala Center Cebu. And with a growing market of coffee lovers, Bo's Coffee had expanded to cater to the discerning taste of Metro Manileños. Bo's Coffee had continued branching out to an array of major urban areas in the country. And as another cozy café opened in Solenad, Nuvali to mark Bo's Coffee's 56th store in the country, it also introduced a new refreshing blend of specialty coffee -- the Biscotti Amaretto. Although this blended coffee drink with biscotti bits and Amaretto syrup is marketed as the shop's summer drink, I for one have and will continue to enjoy this smooth cup with or without the scorching summer heat. We also got to try one of the shop's most delectable treats, the Super Moist Chocolate Cake. It was the first time I got to try a cake from Bo's Coffee, and I loved it. The base cake was so moist, while the choco filling and ganache were simply delicious without being too sweet. This cake is definitely a good treat to complement Bo's Coffee's freshly-roasted cup of caffeine. For a homegrown coffee shop, Bo's Coffee can really compete with international chains with its cozy ambiance, good cup of freshly-roasted coffee, and affordability. Its staff are also friendly and very courteous which makes staying at Bo's Coffee even more pleasurable. So the next time I'm needing my dose of caffeine, I'm sure to head out more to Bo's Coffee not just to enjoy a great cup, but also to support this local venture. 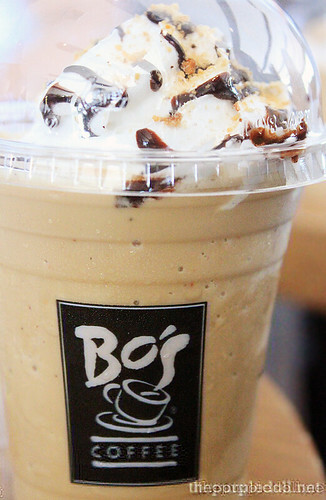 I always pass by Bo's coffee in Megamall but I haven't tried any of their drinks yet. A student gifted me last year with their cookies and they're really yummy! bo's coffee is a good alternative to starbucks. they do offer great tasting coffee mix. I love their black coffee. It's very bold. Coffee is a brewed beverage with a bitter flavor prepared from the roasted seeds of the coffee plant. Coffee is known to be one of the most refreshing beverages throughout the world. Whether it is a black coffee, or a coffe,with eual amount of milk, it is always the best companion,when yo are waiting for some one, or anything like this. So this is locally produced we should support it, aside from the coffee their chocolate cake looks sumptuous. Wow, looks really good. We should support Bo's Coffee because its our own :) I just hope it is affordable. I've been to Bo's coffee only once and have been disappointed with the cake I had. Parang old na sya matigas. Haven't been back since. I have tried Bo's once. So so. 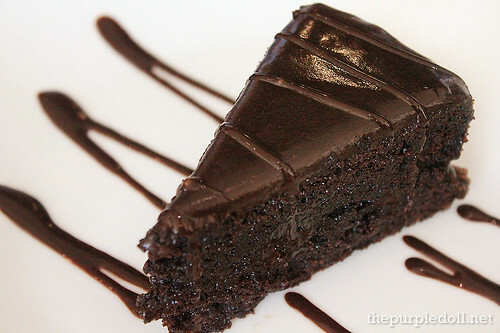 :) But the moist chocolate looks great! I really should try Bo's Coffee next time. Hubby loves Starbucks and I love CBTL kaya laging dun na lang kami napupunta. wow really! I didn't knew that its a Pinoy venture. I am a regular client of Bo's, I like their coffee so much! so that's why. I will definitely try this one out based on your recommendation. I am a coffee drinker and I love trying out different cafes. I am into coffee and Bo's definitely is on my fave list of coffee shop. I'm glad they already branches outside Cebu. It's good that there's already Bos to add variety to the coffee alternatives in Manila. I'll surely try this. I think that we should try to patronize our own products so that we can prove to the world that our products are also world class. Bo's Coffee now gives us consumers more selections aside from the established coffee shops in the country. free wifi ba sa bo's coffee sm north? Bacolod Chicken Inasal: Eat Like a Hero!